Relieves the following symptoms associated with gastritis: Use for acid stomach, bloating and stomach-heat, anti-inflammation, pain relief, regulating energy and promoting digestion. It is safely and effectively promote and maintain general gastrointestinal health without harmful side effects. 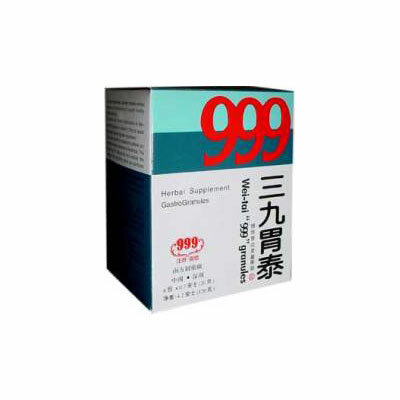 Wei-Tai 999 Capsules is an herbal supplement that helps promote and maintain general gastrointestinal health by establishing natural balance in the body. Chronic gastritis, superficial, erosive and atrophic gastritis, gastric pain and distension, gastric hyperacidity and discomfort, epigastric pain, dyspepsia, etc. Mix contents of 2 to 4 packets with water, 2 times a day as needed. Do not overeat, smoke heavily, eat pungent or high acidic foods, consume drinks high in sugar while taking this medicine.